FROM ballerinas to zombies, these young social enterprises are making waves in the Brisbane community and beyond. As finalists in the Social Entrepreneur category at the 2016 Brisbane Young Entrepreneur Awards, they are solving issues and effecting change in society. In its second year, the category attracted many outstanding entries that are all to be commended - proving the city is alive with conscious capitalism. HE'S got the brains, the brawn, a business of substance, and now Anthony Radaza (pictured) has been named the 2016 Brisbane Social Entrepreneur of the Year. Now in its 10th year, Zombie Walk Australia raises funds and awareness for the Brain Foundation. The event keeps obliterating world records by the thousands for the most zombies at a gathering, with its latest instalment at Brisbane boasting more than 22,000 undead walkers in a single day. Zombie Walk has even gained so much traction, that it has inspired smaller spin-offs around the nation. "The influence we've had throughout the event so far has been phenomenal, in Melbourne, Canberra, Sydney and Perth - and to think it all started here in Brisbane," says Radaza. "There are even little zombie walks starting to pop up in places like Toowoomba and Rockhampton because the idea just caught fire." 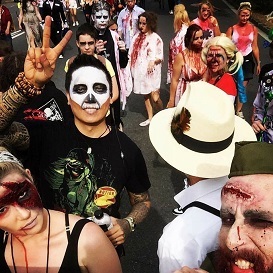 Radaza is well on the way to rolling out a National Zombie Day to support the Brain Foundation, with the goal of having all capital cities in Australia hosting their own walks around Halloween time. THREE truly young entrepreneurs, Courtney Crack, Zachary Fook and Mikayla Ivanov, have made magic with a business that aims to help children and young adults with special needs. Recognising how few exercise and co-curricular programs catered to special needs, the UQ students initially developed The Tippy Toe Co. ballet studio in conjunction with Red Hill Special School on a five-week trial. The team soon discovered they were on to a winning cause, and have now worked with a total of 100 students over the past three years. "As soon as we found out how limited the opportunities were for these children to participate in extra-curricular activity, that's when we came up with idea of The Tippy Toe Co.," says Fook. "It was to provide an activity which could complement the schooling of children with special needs and give them the opportunity to develop emotionally, socially and physically. "For many kids the ballet class is the highlight of their week, when they're not in therapy or in school." 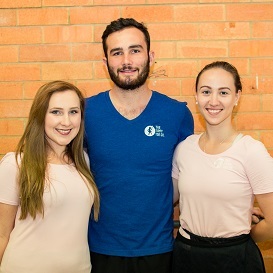 Expansion is potentially on the cards as the trio look towards launching an adapted activities centre, proposing further movement programs and co-curricular activities alongside regular ballet classes. SPUR Projects uses bold new approaches to tackle the growing rate of suicide among Australian men, such as creating Australia's largest ever mental health survey: How Is Australia Feeling. The survey was an opportunity for Spur to move beyond video and campaign production and into the field of big data. 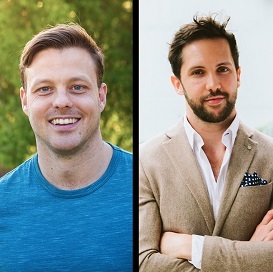 While Crockford and Stubbs' video campaigns have been adopted by beyondblue and attracted a national audience through television shows such as The Project and Man Up, the business model was fickle. This move to data will help create a sustainable business model for the venture, rather than it having to rely on grants to produce content. "The not-for-profit sector is very competitive," says Crockford. "There is not a lot of money going around and there are a lot of people wanting money. "Going after grants and sponsorships is fickle. "A big shift for non-profits is to become profit for purpose and that is the future. To deliver a product that is in line with our organisation that can be purchased is going to help us do good for the world." The idea for Spur Projects came after a friend of one of the co-founders took his own life, soon followed by the father of one of their directors. "It spurred us on. It made us question why our mate thought it would be a better option to take his own life, rather than reach out," says Stubbs. A turning point came after a comment was left on one of Spur's YouTube videos, which said that it had saved their life. "The penny dropped, we could save peoples' lives. We had to keep doing this." 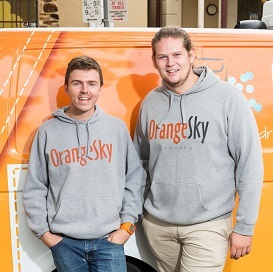 WHEN Nic Marchesi and Lucas Patchett talk about the people they help through their charity Orange Sky Laundry, they call them 'homeless friends'. Orange Sky Laundry is not only a service to wash clothes, or have a shower, but one where people can talk and get support while they sit on the orange chairs around each of the charity's 11 mobile laundries and wait for their washing to be done. The idea is one that Patchett and Marchesi, both aged 22, sat on for around 18 months while Patchett was working in Canada and the United States. With time on his hands upon his return to Brisbane, it was the ideal time to make it happen. "Nic and I are curious people and are interested in innovative ways to help people," Patchett says. Patchett, an engineering student, got to work fitting out a van with washing machines alongside his friend Marchesi. "We started the first van pilot project to test the waters and see the impact we could have," he says. "This is something that had not been done anywhere else in the world. We built the van in October 2014 and three months later we had funding for our second van." Quantifying the cost of a load of washing at $6 gave potential donors the feeling they could make a difference and the pair had soon raised $2,500 from people all over the world. "Straight away people thought this was a great idea. People were really buying into the concept of two young blokes from Brissie giving it a go," Patchett says. Now, Orange Sky Laundry has 11 vans across Australia, 10 staff and 622 volunteers washing 7.2 tonnes of laundry each week while providing 1,200 hours of 'positive, genuine conversations' every week. JUICED TV is an Australia-first initiative benefitting the health and wellbeing of sick kids at Lady Cilento Hospital, by giving them way to engage and communicate with one another. Russell, who has hosted two of Australia's leading children's TV shows, Totally Wild and Twisted TV, saw the joy the children got when she filmed some events in her capacity as a volunteer at the hospital, forging a strong connection with them in the process. "It was a unique distraction for the children, and created tangible memories for them and their families," she says. "I thought, 'if we could just film this all the time'." Russell went to spend a year in London, but couldn't forget the idea of Juiced TV. She came back to Australia on a mission to make it happen. To get the project off the ground, Russell ran a crowdfunding campaign and secured a grant from Lady Cilento Hospital itself. "The reaction has been unreal, and it has really snowballed," she says. Juiced TV has already interviewed stars including Johnny Depp and Taylor Swift, and Russell is building an app so kids across the country have access to the show. "It has been a really great thing to engage with the community and provide a tangible outcoming from filming for a day, while also creating experiences for the kids," she says. "Every week we see the difference we are making."